It doesn't work on my Ubuntu PC: I tried it before writing my reply, and now tried it again... Maybe I'm doing something wrong? Maybe I am misunderstanding your reply Hans, but my trouble is ... for example, I make a full circle of two segments like this..
And I select one side of the circle to split so that I can either paint it a different color, or delete the extra section I don't need.. I can make many little walls to mimic the splitting, but I was wondering if there was a faster way to do it? - Changed the indicator and the behavior at the bottom left of lights to change their power. We're getting closer to version 3.0 now. Hans, maybe the shortcut Ctrl + Enter is associated to something else in your system? Does it work for other Linux users? You're amazing! Busy with work and still you find time for a new beta. Do you ever sleep at all? I saw a typo: in 3D view it says Got to point of view, that's 1 letter too many. With CTRL+ENTER, are you referring to drawing round walls? I can do that but with CTRL+CLICK 2nd POINT and then drag. I'll try and test-drive this version in the next few days. Thank you Hans for your feedback. My work outside is over now, so I have time to finish programming this version 3.0. - Recovered auto saved files at program launch to let user review them after a crash. I reproduced the auto save / auto recover behavior of MS Word in Sweet Home 3D. Please try if it works correctly, by simply crashing the program and relaunching it. - Added Arc extent spinner to Wall modification dialog to adjust round wall after its creation. - Added Unchanged / Mat / Shiny radio boxes to Furniture modification dialog to control furniture shininess. - Placed by default the compass at the left of the plan for existing homes (thank you Hans for this suggestion). - Kept a free zone at the furniture center of small pieces to be able to move them without deselecting them first. - Took into account light furniture angle to place correctly the light sources it contains. - Added the five following lights to the default catalog (I felt that new users who didn't install any SH3F files yet, wouldn't understand the purpose of lights if they had only light sources!). This will probably be one of the latest beta version with new features. I may add mouse wheel zoom on cursor if it isn't too difficult and fix a few minor bugs, but globally, I feel we have now a pretty nice version 3.0 within reach. Thus, it's going to be translators' turn and I'll try to improve help files to describe how to create photos and videos with lights. Just gave the beta 16 a short test drive. First impression is VERY good! - The auto recovery now works like a charm: it opened all 50 or so recovery files for review! HAHAHA The good news is, that it then deletes the temporary file, so that the recovery directory doesn't clog up with old files. Great! I now have the purple pond file I had intended for the design contest. - Arc extend modifier: great! - Unchanged, matt, shiny: great! - Repositioned compass: GREAT! (I have the habit to start my designs at > 0,0 <, so this is very welcome. - Free zone: have to find out more about that one. - 3D normals: I'm not sure what you mean, or what that is. However, maybe later tonight or tomorrow I may succeed in making a cube with a "normal" texture. I think I finally found out how to apply a texture correctly. - Lights: great! I noticed all existing lights in the library also have a power switch! I noticed one minor thing: I remember db4tech telling some time ago that he introduced a new routine for Q2 rendering, that did away with the banding. A quick render I did a few minutes ago, again showed a lot of banding. Maybe it's accidental, I'd have to investigate more. 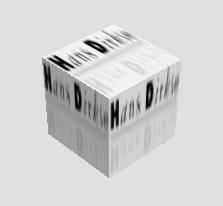 Finally, I managed to make a box with the texture correctly applied on all sides. Unfortunately, you cannot apply a texture to this box from within SH3D, because then the textures are applied incorrectly again. So, you have to manually edit the OBJ and MTL file to change the image. When I opened this beta version, 4 recovered files came up. I just closed the first 3 that I didn't want then I kept the one open that I wanted to work with. Will it be doing this by default when you first start it up? The files it recovered were, I think, simply closed because I was done with them. I played with the lights some more and found that I was able to turn on the already existing lights. Anyway, it's much better looking now. Well, I'm super-eager to try the 3.0 beta, but I can't seem to install it. Java Web Start loads it, but always ends with the error: "Unable to launch the application." Uninstalling through the Java console and reinstalling does no good. SW3D v2.6 still runs (and uninstalls and reinstalls) correctly. Is there any particular information about the error detail or my system that you might need to pinpoint the problem?